They’re scented with your choice of cardamom or cinnamon (I chose the former). They get dusted with a shower of powdered sugar before you pick them up with your fingers or stab them with the tines of a fork to dunk into thick, velvety, home-made lemon curd. You can make the lemon curd the day before to speed things along. 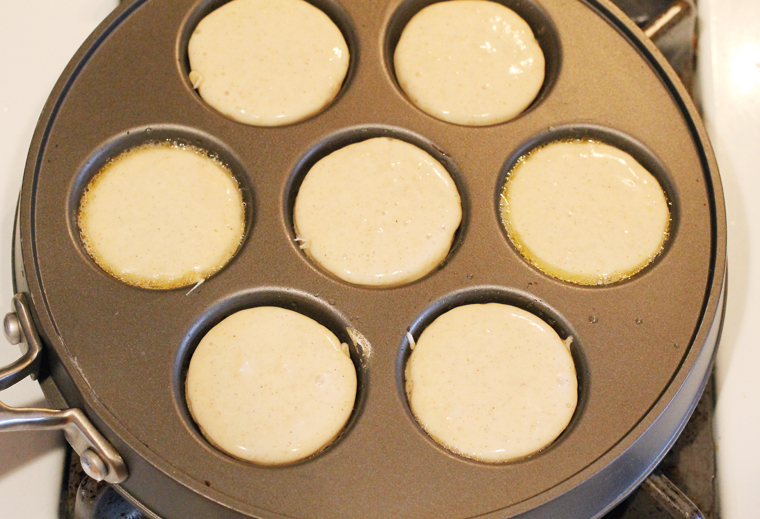 Then, the easy aebleskiver batter gets whisked together in no time flat. The trickiest part is just forming the aeblisker in the special divot-ringed pan that you will need for this. It takes a little practice to rotate them just so in order for them to become perfectly spherical. I’ve made aebleskiver before, but it’s not something I do on a regular basis. As such, I was a little rusty, and my first few were a little lopsided to be sure. But after that, I got the hang of it again. I found that using a teaspoon and thin chopsticks or skewers help enormously in turning the aeblisker in the pan. Use a ladle or a small ice cream (or cookie scoop) to fill the divots in the pan. As the bottoms start to firm up, start rotating the aeblesiver using a teaspoon and wooden skewer. The aebleskiver are barely sweet and the cardamom is quite subtle. You could always add more cardamom or cinnamon, if you like. The lemon curd is a perfect accompaniment. Besides its sunshine-y color, it adds a lovely bright tang, a bit of sweetness, and a luxuriant creaminess. It’s a sweet taste of Denmark — and Portland — in two bites. 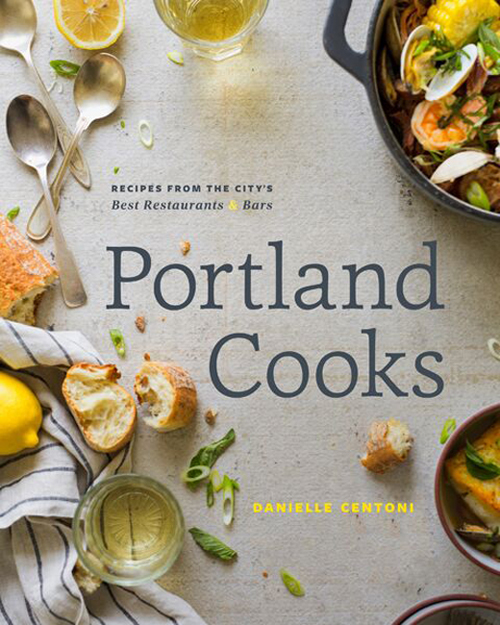 CONTEST: One lucky Food Gal reader will win a copy of “Portland Cooks” by Danielle Centoni. Entries, open only to those in the continental United States, will be accepted until midnight PST Aug. 25. Winner will be announced Aug. 28. Just tell me what you love most about Portland, Ore. Best answer wins. A fun twist to pancakes. To make lemon curd: In a food processor, pulse lemon zest and sugar until well combined. Add the butter and blend until the mixture is smooth. With the machine running, add the eggs, one at a time, and then the lemon juice, processing until incorporated. 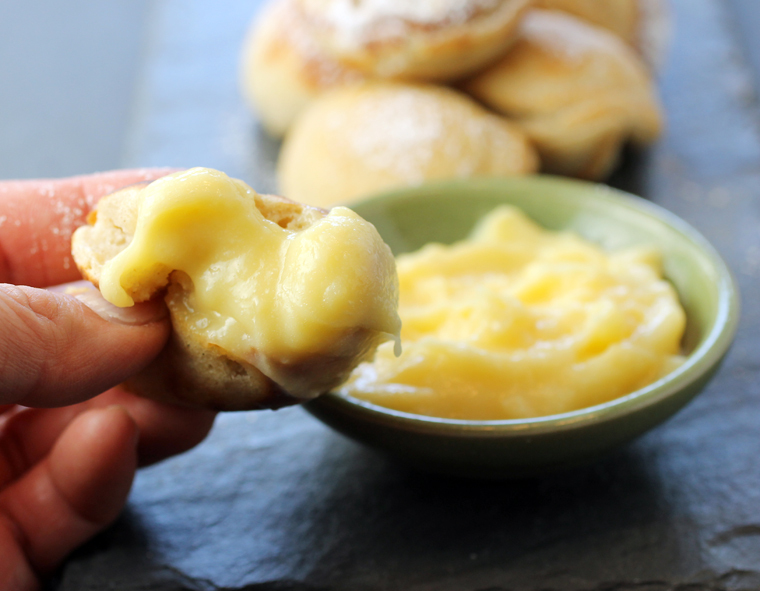 To make aebleskivers: Combine the egg, vanilla, and lemon zest in a mixing bowl. Add the sugar and whisk vigorously until mixture is light in color and doubles in volume, about 5 minutes. (Alternately, you can do this in a stand mixer fitted with the whisk attachment.) Slowly mix in 2 tablespoons of the melted butter. In a small bowl, sift together the flour, baking powder, cardamom or cinnamon, and salt. Alternate stirring the dry ingredients and the milk into the egg mixture, mixing just until combined. 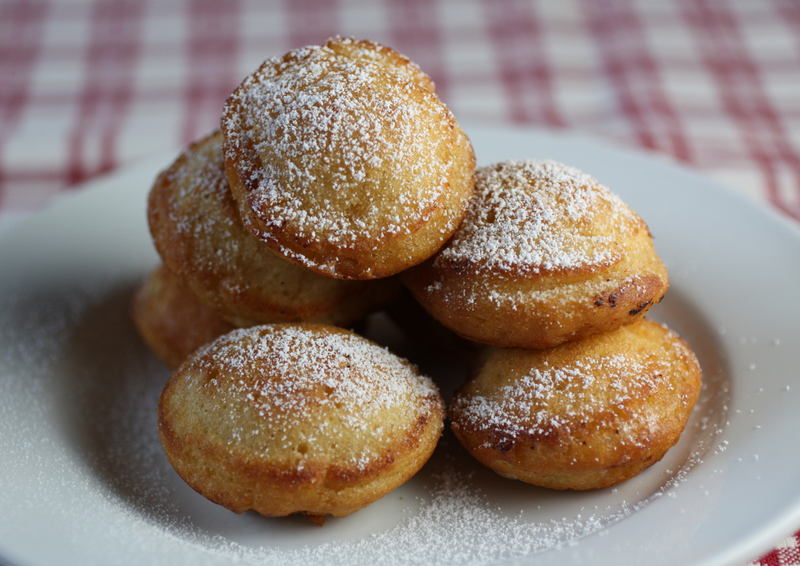 Place an aebleskiver pan over medium-low heat. Set a small bowl of the remaining 2 tablespoons melted butter and a pastry brush near the stove. 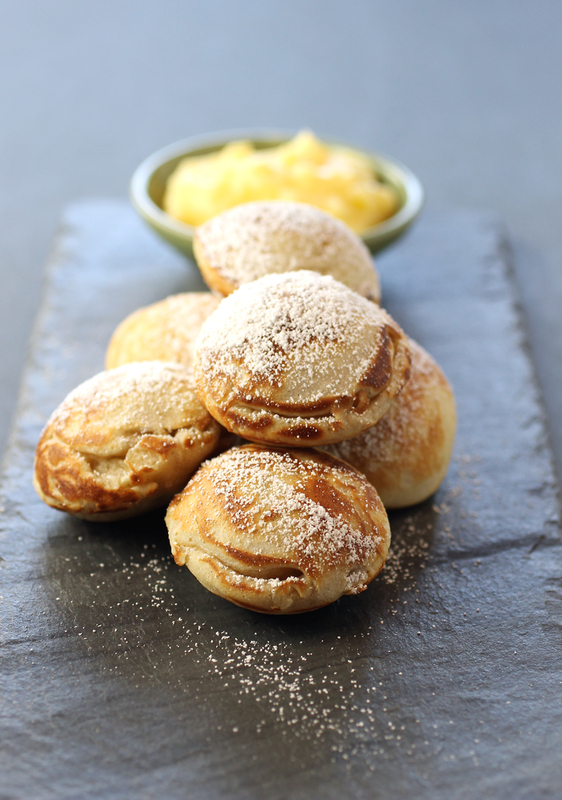 Heat the oven to 200 degrees and set a baking sheet inside to keep the finished aebleskiver warm until serving. When the pan is hot enough to make a drop of water sizzle, brush each cup lightly with melted butter and use a ladle to fill batter up to slightly below the rim. 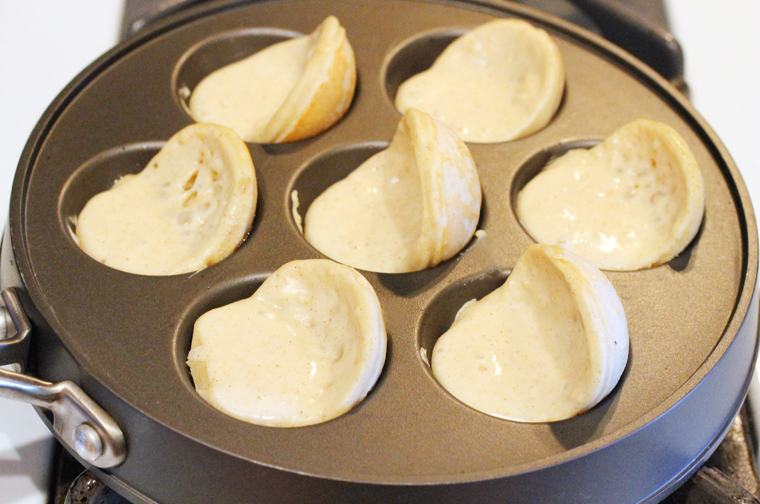 In about 1 1/2 minutes, thin crusts will form on the bottoms of the aebleskiver, but the centers will still be wet. 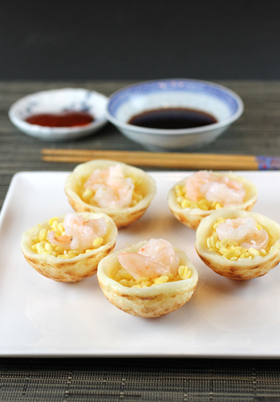 Insert a slender wood skewer or chopstick all the way through and push to gently rotate each aebleskive until about half the crust is above the cup rim and uncooked batter flows down into the cup. Cook until a crust starts to form on the bottom again, about 30 seconds. Use two skewers to rotate each aebleskive again, this time turning them all the way over to form a ball (it helps to make a more rounded ball if you turn them diagonally this time.) Cook, turning occasionally with the skewer, for another 1 to 2 minutes, or until the balls are evenly browned and no longer moist in the center. (A skewer inserted into the center of the last ball should come out clean.) If balls start to get too brown, turn heat to low until they are cooked in the center. Lift cooked balls from the pan and keep warm. Repeat with remaining batter. 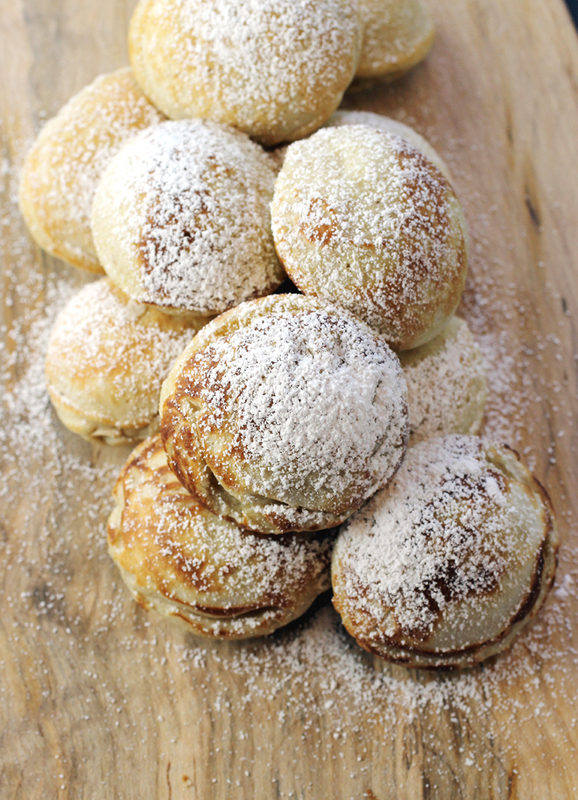 Arrange aebleskiver on a serving platter or pile into bowls. Sprinkle with powdered sugar and serve with lemon curd on the side.